"Increase your English fluency and confidence in 30 days, with my new English language course!" Are you looking for an English language course, to quickly help you understand people speak real English and feel more confident? Are you tired of practicing English with boring, basic courses? Introducing "It's English Time", a new self-study eCourse specifically designed to help improve your understanding and increase your confidence. Like most people, you need an English course that is effective, affordable and fun, which is exactly what "It's English Time" is. - Save time by focusing on useful English that people speak in the real world. - Laugh at the funny situations while learning a lot of English expressions, vocabulary and phrasal verbs in context. - Save money because there are no shipping costs (just a quick download). - Study in the comfort of your own home or anywhere with your laptop computer or mobile device. - Increase your confidence rapidly as you realize you can understand each video full of real English. What is "It's English Time"? "It's English Time!" is an eCourse based on 20 entertaining videos (created by Jerry and Orrin Zucker). These videos present stories from Jerry's life about everyday events and problems. The course comes with almost 400 pages of exercises, definitions, examples and reference materials to help you understand each video (not to mention the 20 subtitled videos as well!). 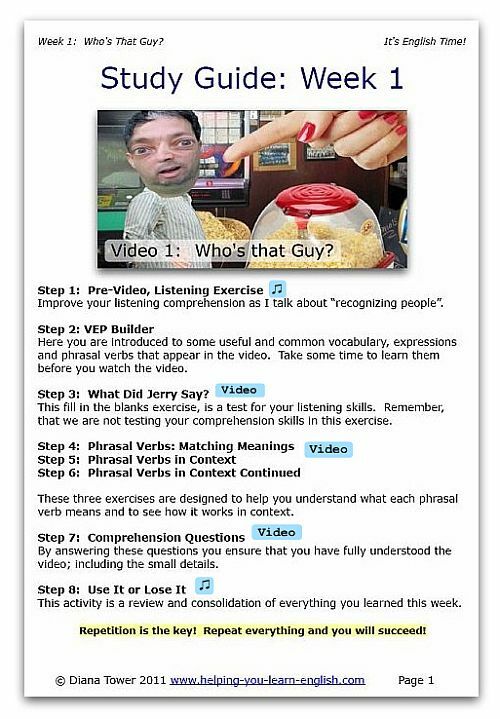 Each Unit (approximately a week of study) contains 8 exercises that help you learn more about the topic and understand all the vocabulary, expressions and phrasal verbs presented in each video. These activities include listening comprehension, matching meanings, and using phrasal verbs in context just to name a few. Sound Interesting? Get Your Copy Right Now! just click the "buy now" button above. You can use PayPal or any major credit card. - Understand native speakers when they tell stories. This is vital to fluency and listening comprehension because most social interaction is with friends or colleagues exchanging stories. - Learn the meaning and use of vocabulary (expressions and phrasal verbs) presented in each video in context. This will help you remember the new information and to use it in other situations. - Gain confidence as you progress from not understanding a video very well, to understanding it completely. How does this English language course increase your fluency and confidence? 1) These videos were created to entertain. The English that you hear and read in these videos is 100% authentic. It is real English that you would hear if you were travelling or living in an English speaking country (USA). 2) The videos are the perfect length. In the course you will explore funny videos that last between 2-5 minutes. There are hundreds of expressions and phrasal verbs to learn and you can do so without feeling overwhelmed. The Cost will surprise you! If you chose to have classes with me and to do this course over a 4 month period it would cost you over €600. You would see a dramatic improvement in your speech, confidence, vocabulary and listening comprehension, but €600 is a lot of money. Not to mention the hassle of organizing your life around English classes at specific times. That is why, rather than creating a course based on live classes with me, I created a self study eCourse that gives you more freedom and also allowed me to greatly reduce the cost. This self study program is worth €30 a unit (€600 total), but I want to make this program more affordable, so that you can experience the pride of completing it and discovering how amazing your English can be! That is why I am offering it to you today for less than €5 a unit! Note: At €97, you get each unit (8 hours of exercises, videos, audio and transcripts) for only €4.85! PS: If you aren't 100% sure that "It's English Time" is the right English language course for you, just try it for yourself. If you complete the course but still cannot 100% understand each video, simply email me within 60 days of purchase and I will give you a full refund. 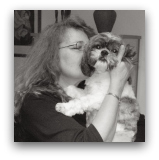 I have included one free gift (the MP3s for step 8), but I think you deserve another one! 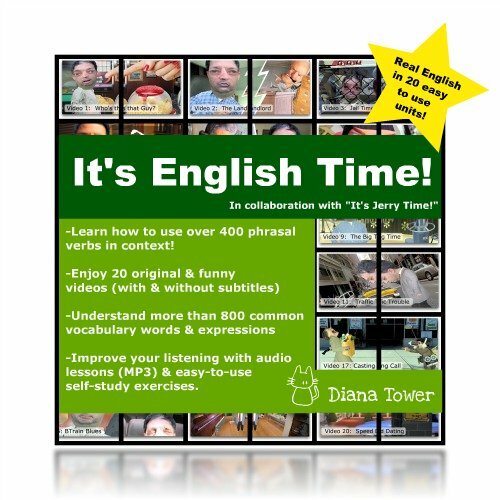 So, I'm including my latest audio English language course, "English Express" (worth €16) for free too, when you get your copy of "It's English Time!" today! At first I was a bit sceptical but "It's English Time" surprised me. Why? Because I learned English while being entertained. When you are doing each unit you feel like you are doing a puzzle. After finishing each unit you solve that puzzle!! You understand the different vocabulary and phrasal verbs and the most important thing is that your puzzle connects to real life. You can't imagine how much I love these videos but I thought I could never understand every single word! However, I was completely wrong! Diana, made introduction pages, where she explains how to study every unit in details. It's phenomenal! You'll discover step by step what you have to do. Every video needs at least one week of serious study. It's up to you to follow her advice but if you do, you will succeed! I'm sure that all those who will work these 20 videos continuously will notice incredible progress.